Prime number java means the number has divisible by 1 and itself. Writing a Prime number program in java is very easy. In the following program of java prime number we taken as a user defined input. For calculating the prime numbers in java we required a math function. Prime number program in java is easy to implement. To find prime numbers in java we apply for loop logic with the counter to increase the number. Java program to find prime numbers is given as spoon feed below. 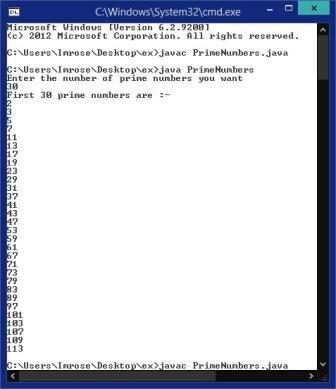 From this you can easily calculate the prime numbers in java how much you have to calculate.